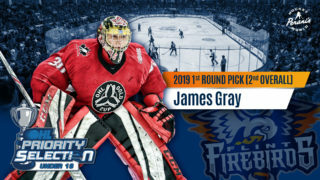 Flint, Mich. – Max Kislinger and Ryan Moore both tallied three points, Jake Durham and Ethan Keppen each scored twice and the Firebirds notched three short-handed goals in a 9-2 victory over the Saginaw Spirit before a capacity crowd at Flint Iceland Arenas on Saturday night. Jake Durham started the scoring off for the Firebirds at 6:53 of the opening frame. Ryan Moore head-manned the puck to Maurizio Colella on the left side. Colella dished it to Durham who was crashing the net and buried from the right circle for his first of the night. The Spirit scored their first-of-two on the night when Ben Badalamenti found the back-of-the-net from the right circle at 12:06. Garrett Forrest made a highlight-reel save in the final minute of the period, denying a dish to the right circle and a one-timer on goal with his left pad. The game remained tied 1-1 after 20 minutes of play with the Firebirds outshooting Saginaw 11-6. Firebirds’ Luke Cavallin was inserted into goal to start the second period. Forrest recorded five saves on six shots in 20 minutes. Max Kislinger, who was acquired in a trade with the North Bay Battalion this summer, scored his first of the night by crashing the net on the power-play. Colella and Moore picked up the assists at 3:59 of the middle period. Seven minutes into the second frame, Cavallin made an amazing save on a 2-on-1 play, keeping the game at 3-1. The Firebirds scored back-to-back power-play goals in 2:57 when Durham deposited the puck in the net from the left side of the goal. Hunter Holmes and Moore picked up the assists, which ended up being the game-winning goal. Cavallin was right back at it, making two big saves on the door-step. Almost identical to his first goal, Kislinger earned his second at 15:23 with Ty Dellandrea picking up the helper. The Firebirds added a short-handed goal with 1:28 remaining in the middle frame when Jack Phibbs found Littlejohn in the slot from behind the goal-line. Littlejohn fired the puck into the net to earn Flint a 5-1 lead. 27 seconds later, Ethan Keppen found twine for his second goal in two games with 1:01 remaining in the middle period. The Firebirds led 6-1 after two periods of play and were outshooting the Spirit 20-13. Hunter Holmes earned his second of the pre-season while short-handed at 14:01 of the third period. Holmes found an opening and faked to the right-side of the net before scoring blocker-side. The Spirit scored their final goal of the night at 16:17 when DJ Busdeker picked up a loose puck at the right circle and scored glove-side past Cavallin, making the score 7-2 Flint. C.J. Clarke notched his first of the pre-season with 1:12 remaining in the contest before Ethan Keppen finished off the scoring with 19 seconds to play. The Firebirds finished the pre-season posting a 9-2 victory over the Spirit, outshooting Saginaw 28-21. Luke Cavallin made 14 saves on 15 shots in 40 minutes. 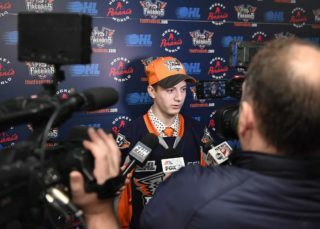 Next up for Flint, the Firebirds begin their third season in the Ontario Hockey League (OHL) this Friday, Sep. 22 in Kitchener, Ont. The Firebirds play the Rangers with puck drop set for 7:30 p.m. at the Kitchener Memorial Auditorium. The Firebirds will return to the Dort Federal Event Center for the 2017-18 OHL regular season Opening Night on Saturday, Sep. 30. Puck drop is set for 7 p.m. against the Ottawa 67’s and all fans in attendance will receive free rally towels and magnet schedules, sponsored by Dort Federal Credit Union and Little Caesars. Opening Night tickets can be purchased at the Dort Federal Event Center Box Office, Monday through Friday from 9 a.m. to 5 p.m. (ET), by calling (810) 744-0580 or online at ticketmaster.com here. For season ticket information, flex tickets or group outings, contact Dominic Gutierrez at (810) 701-8536 or domg@flintfirebirds.com. To book a private suite, please contact Karla Turner at (810) 744-0580 ext. 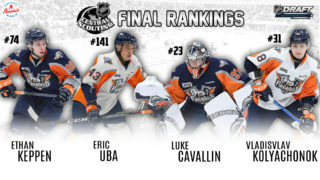 213 or email karla@flintfirebirds.com.